First son of Tokugawa Ieyasu, founder of the Tokugawa Shogunate. Born as Matsudaira Takechio, his name was changed later to adult name Nobuyasu. His mother and him first were under the care of Imagawa, but in 1562 moved to Okazaki. In 1567 Nobuyasu married Oda Nobunaga's daughter, Tokuhime. The marriage was politically motivated by the need to strengthen the alliance between Nobunaga and Ieyasu. In 1570, when Nobuyasu reached maturity and performed his genpuku ceremony, he was appointed the lord of Okazaki castle. In 1575 he was suspected of misconduct in the matter of a conspiracy involving Takeda Katsuyori, Oga and Matsudaira. As a result, there was a confrontation between Nobuyasu on one side, and his wife and Ieyasu on the other. His wife sent a letter of accusation against Nobuyasu to her father Nobunaga, thus creating tension between Ieyasu and Nobunaga. Consequently, Nobuyasu was moved from Okazaki to Horikawa castle, then to Futamata castle. Shortly later he was forced to commit suicide and was buried in Futamata, Tenryu city, Shizuoka prefecture. 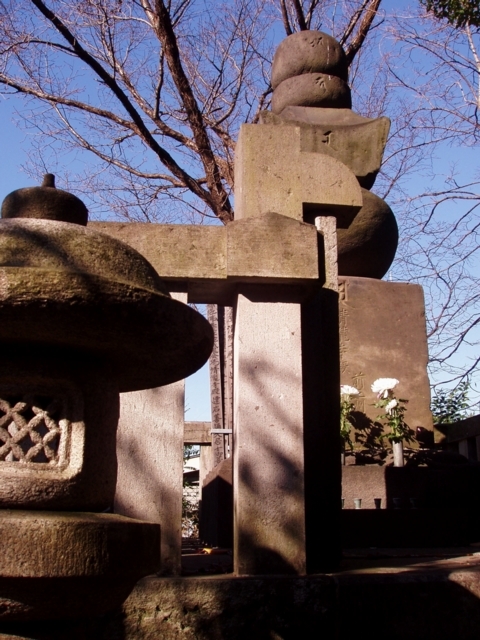 To commemorate his death, Hattori Hanzo built Sainenji at the center of Edo (present day Tokyo) where he erected a stone pagoda as a memorial site for Nobuyasu.